We have in store for the clients excellent quality of Aloe Vera Processing Machinery. This range is manufactured under the supervision of our skilled teammates using qualitative raw-material, in adherence with the international quality parameters. 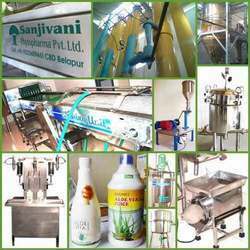 These machines are used in processing aloe vera, amla and wheat grass powder For ensuring that we are offering a quality approved range, all the products are throughly examined by our quality controllers team. Our clients can avail this range from us in various sizes, designs and specifications as pr the demands. We hold expertise in offering a wide range of Aloe Vera Powder Manufacturing Machinery. This fully automatic machines are fabricated employing advanced technologies, in compliance with the industry set quality parameters. All the products offered by us are throughly examined by our quality controllers team to ensure their trouble-free functioning at our clients end. Looking for Aloe Vera Processing Machinery ?